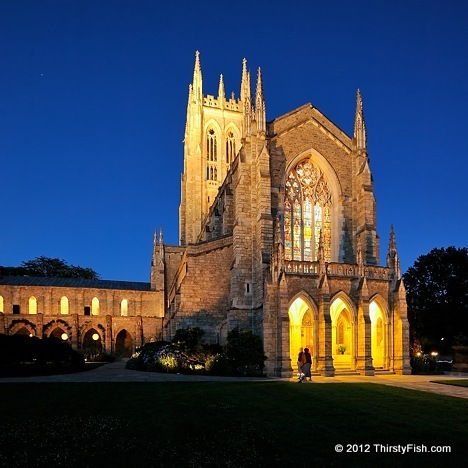 This beautiful Cathedral building with its pot metal stained glass widows is the centerpiece of the Bryn Athyn Historic District. The New Church is an inclusive Christian congregation. The relationship between religions and how their adherents "see" people outside their faith can be examined as exclusivist, inclusivist or pluralist. How we "see" others, dictates the way we treat them. How we "see" anything, dictates the way we treat it. If we have a distorted vision, and we do, then we are bound to mistreat others and things. In the core message of all world religions, the inappropriate and unjust treatment of people and things is a sin! Those with a conscience, who are familiar with history of religious conflict, who have personally experienced religious persecution, have at one point or another thought: "If this is religion, I don't want any part of it!". Many religions institutions and religious leaders blame loudmouth atheists, secular politics, and even science for the recent "epidemic" of atheism, but they fail to understand that religious exclusivism is actually what pushes people away from religion. Claims of "superiority of belief", that "there is no salvation in other religions", is what provides organized religions with a way to quickly evangelize masses and/or unite their congregations. But this very exclusivism employed to "unite", is a slippery slope that leads to, and incites, xenophobia, hatred and eventually violence. Any religious understanding or interpretation that is exclusive can not be what was intended. The vision is not in the eye, for the eye can be deceived. The vision is not in a Synagogue, Church, Mosque, Vihara, or a Temple. First and foremost, the vision is here in the heart. See with the heart.